The Dark Knight (+ Digital Copy and BD Live) – $23.99 Explore your favorite movies through BD-Live™, an interactive gateway to exclusive content.The follow-up to Batman Begins, The Dark Knight reunites director Christopher Nolan and star Christian Bale, who reprises the role of Batman/Bruce Wayne in his continuing war on crime. 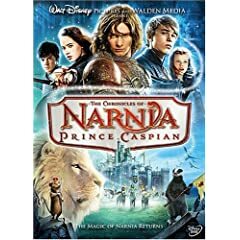 The Chronicles of Narnia: Prince Caspian (2008) – $14.99 The magical world of C.S. Lewis beloved fantasy comes to life once again in Prince Caspian, the second installment of The Chronicles Of Narnia series.Continuing the adventure of The Lion, The Witch And The Wardrobe with more magic and a brand-new hero, Prince Caspian is a triumph of imagination, courage, love, joy and humor your whole family will want to watch again and again.